Many an accolade has been lavished upon the beloved Mazda MX-5, extolling its virtues of balanced handling, fun and reliability. Its simple, elegant and beautifully engineered design has made the car perfect for superbly competitive and exciting racing. 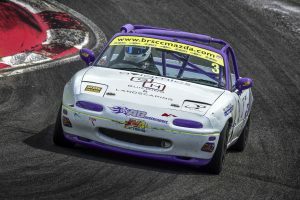 The MX-5 race scene has been gaining momentum for many years now and with 3 dedicated racing series (boasting a total of more than 100 drivers) it’s become the go-to car for entry level racers. Blasting throug h the iconic Paddock Hill Bend at Brands Hatch is a far cry from the experience of the average MX-5 driver, who will be more familiar with zippy summer evening drives through the woods. But what is the humble MX-5 really capable of in the hands of a real racing driver and what does a racing lap feel like? I had the opportunity to take the snug racing seat next to the MX-5 Owners Club’s very own ‘tame’ racing driver, 18 year old Ben Tuck, at the Club’s Blyton Park Track Day earlier this year. 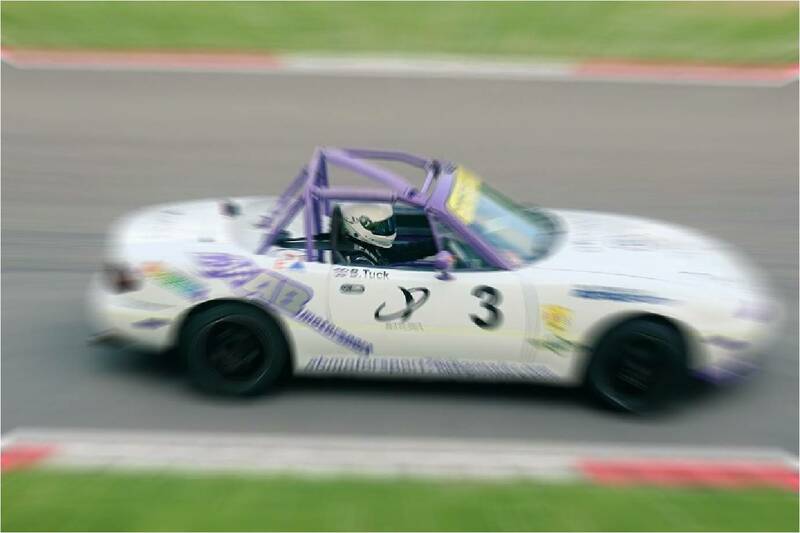 Ben is competing in this year’s BRSCC Mazda MX-5 Championship, one of 60+ drivers to do so. And he’s no ‘wet behind the ears’, wide-eyed rookie either. At the time of writing he’s 3rd in the Championship and a serious contender for the title in this, his first ever season of car racing. 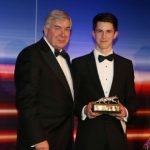 In the Mazda paddock he’s acquired the nickname ‘The Kid’, but he’s already an instructor at Bedford Autodrome and one of the Motor Sports Association’s elite young Academy drivers, looking to move to GT or Touring Car racing in the coming years. On first meeting him, Ben is a slender, clean cut, charming and quietly unassuming young man. But when the subject turns to racing, he becomes utterly uncompromising, with a steely eyed killer instinct behind the wheel – as I was about to find out. His car is the venerable Mk1 NA model, with the distinctly unsporty 1.6L engine. With championship regulations tightly controlling any performance enhancing modifications, Ben’s race car was probably one of the least powerful MX-5’s out on track that day and I was told we were also on completely worn out test tyres. 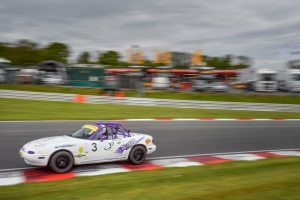 The white and purple number 3 car sits very low on 15 inch wheels shod in low-profile, treaded road tyres – purple being the colour of the team that run the car, AB Motorsport. It has a meaningful stance, its purple front splitter only inches from the track. 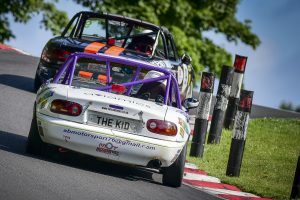 The car was fresh from Ben’s last race at Brands Hatch where he took pole position and claimed fastest lap of the weekend. Alongside his lucky race number, it bore the dents, scratches and scars that gave away the fact that this type of racing is tough and involves a lot elbows-out pushing and shoving. I wondered if this polite young man may have another fiercer side to his character. To protect the occupants in the case of an accident, the car is fitted with a prominent safety cage in place of the soft top. The interior is distinctly minimalist, absolutely anything not required for racing is stripped out, no carpets, no mats, no door panels or handles. The centre console is missing, replaced by a blank panel that offers only a big red electrical master switch, an ignition switch protected by a red safety cover, a red light, a starter button and two fire extinguisher handles. Worryingly these were disconnected as the fire extinguisher had been removed to accommodate my passenger seat! The only other adornment was a complicated looking lap timer on top of the dashboard. Getting in to this MX-5 is more challenging than with its road-going cousin. It’s even lower and the roll cage has two thick bars that take up the space where the inside of the door would be. Once through the gap in the roll cage I must fold in half to manoeuvre into the hard racing seat on the passenger side, being careful not to snag the cables going to the small battery in the foot well. The seat snugly holds onto the hips and back and a web of straps envelope the body from behind and lock into a quick release harness buckle at the stomach. I was advised to make sure that the shoulder straps were especially tight as we would be braking particularly hard….. 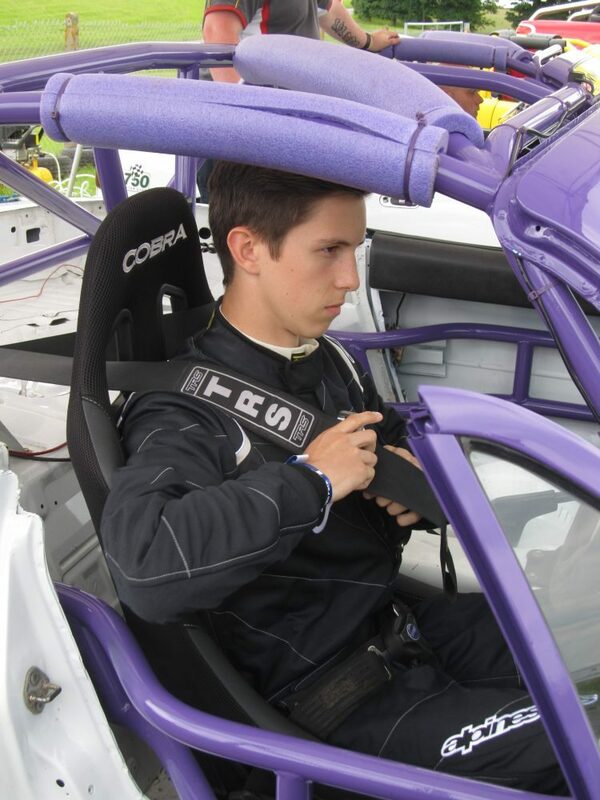 Dressed in black overalls with a HANS device and a white helmet, Ben leapt into the car next to me with a fluid ease that gave away his familiarity with this machine and within seconds he was strapped in and putting on his gloves. As he flicked the switches and punched the starter button, the car came alive and it was clear that this machine had one purpose only. Sporting a wide racing exhaust and without the usual hood and sound deadening carpet and mats, the vibration and shaking were transmitted directly through the white painted floor to the body. This was going to be an assault in the senses. Shouting over the engine, Ben checked all was well with a thumbs up and we eased into the queue lining up for the track. Whilst waiting in line, Ben gave a polite but firm briefing about touching anything (don’t! ), what to do if I felt sick, and that we would be taking it easy in the first few laps to allow the tyres and brakes to come up to temperature. Before long we headed the queue and faced a marshal with a green flag and beyond him the first straight down to Jochen corner. As we waited Ben stared motionless down the straight and his eyes stopped moving or blinking. For him, every lap is deadly serious. We were away! The acceleration was a solid shove in the back as the revs surged towards 7000rpm and in an instant we were into 2nd gear and then 3rd as the push continued, the noise phenomenal. The acceleration was not a whole lot more than a standard MX-5 but the sheer connection with the engine through the vibration and ripping exhaust noise was exhilarating and a smile pushed my cheeks into the padding on the inside of my helmet. Within seconds we were flying towards the first bend, a 90 degree left-hander. As my foot went down onto the phantom brake pedal that I imagined was sitting in the foot well, time slowed down. Not only were we not braking yet, Ben was still very very firmly on the throttle. Smile fading, I looked across and Ben had his head slightly lowered and tilted in the direction of the next corner, looking for all the world like a relentless and emotionless robot. Way, way beyond what I thought was the last moment, Ben simultaneously stamped onto the brakes and flicked the wheel. The sheer force of the braking was astounding, far harsher than in a normal road going example and I was slammed against the shoulder straps (should have done them up tighter…). Into the corner and as the weight transferred, the tyres began to squeal and I could feel the car sliding and moving about underneath us. Ben balanced the car with tiny movements of the wheel and as he fed in the power the push in the back came on again, surging us forward towards the curbs at the left-right chicane of ‘The Ump’. There was absolutely no lifting at all as we hit the curbs with the drivers side wheels, the car kicking up as we went, seeming to be almost floating upon the surface of the track. As the car settled into the long left hander of Lancaster I could hear that loud exhaust above the screaming engine as we climbed up to 4th gear, every moment the car squirming on its tyres. Ben guided us with absolute precision onto the curbs on the exit and the car buzzed as we motored across them accelerating on to straight. A few moments to catch up with what the last 10 seconds had just delivered, and thump! – I was slammed against the shoulder straps under braking into the chicane of ‘The Wiggler’. Ben flicked down a gear with an angry little rev and twitched the car into the left-hander. Even before the car seemed to react he was commanding it to run across the inside curb on the right. Again the curbs lifted us up as the power blended back in and as the back stepped out slightly, he corrected with lightning quick movements on the wheel, back to the left and onto the next straight running wide onto the exit curbs. Looking across at Ben, his head was fixed behind the futuristic looking mirrored visor, tilting slightly in the direction of each turn, a characteristic he picked up during his karting days, he later tells me. Another long straight now and ahead were 2 other Mazda’s, lower and with wings and wide exhausts. On a normal road they would look fast, but we caught and flashed past the first in seconds. Ben jinked out to take the inside line as we accelerated towards the next corner, the left-hander at Bishops. I watched the other car as we accelerated past. Suddenly it flew backwards out of my vision as if it’d been snapped back on a bungee rope. That was his braking point for Bishops, but I had time to turn and watch the corner approach as Ben continued to accelerate our little car towards it easing back to the outside of the track. No reaction from Ben, but I could tell that that moment of satisfaction was replaced instantly with the overwhelming hunger to pass the next car. Again, impossibly late Ben hit the brakes, blipped the engine and changed into 3rd gear, his feet and hands seeming to move with deliberate precision but at the same time lightning fast, mixing left and right-foot braking with smooth steering movements and working of the gears. The car reacted and as we slithered round the bend we seemed to be on the very limit of grip, yet somehow the car ended up hitting the perfect apex and running out just enough over the curbs on the exit. The overwhelming impression was that this charming young teenager had been transformed into the Terminator behind the wheel – precise, robotic, focused and utterly, completely relentless. A short straight and then we were upon the uniquely named left-hander of Bunga Bunga. With a dab on the brakes to help the car turn in, Ben was early on the power to accelerate the car the whole way through the corner giving that feeling that the car was skating over the top of the road rather than stuck to it. The speed building now, up into 4th gear and Ben’s right foot was fixed flat to the floor as we raced towards the awesome S bends of Port Froid. This was taking it easy? I watched his feet and, without the slightest hint of a lift, Ben controlled the weight distribution of the car with delicate grazes to the brake with his left foot. He guided the car into the right and then flick left again a single smooth movement on the wheel, all the while that push in the back building and building the speed. As I looked ahead, coming straight at me was the hay bale on the apex to the second part of the corner. In a slow motion moment I knew we were going to hit it, but it flashed past no more than an inch away from the purple door mirror to my left. All planned, all calm and all designed to get us around this track in the shortest possible time. After the car straightened we were into another huge braking zone for the right-hander at Ushers, down a gear and Ben launched the car into the corner, this time the back end coming round. Before I even felt the movement and without hesitation, Ben wound on the steering, adjusted the power and there we were in a delicately balanced ‘Dukes of Hazard’ style drift, in a sublime dance between steering and throttle. I couldn’t help but let loose a little whoop of exhilaration above the screech of the tyres and the noise of that exhaust. As I looked over to Ben he gave a tiny shake of the head, his internal coach berating him for the tenths of a second lost in that spectacular slide. As the car straightened up we surged forward in a short burst of acceleration into Twickers where we started less than a couple of minutes ago, hard onto the brakes, launch across the inside curb, early on the power and wide onto the exit curb with lots of wheel spin, looking for traction to fire us down the straight towards Jochen again. And thus began the most exhilarating 4 laps of my life, each time around we braked later, took more curb and accelerated earlier, as Ben relentlessly shaved time from each subsequent lap. Afterwards, as we drove back to the paddock, I felt physically drained but at the same time elated. Safely back in the parking bay, Ben snapped the red ignition switch to shut down the engine as the support crew lifted the bonnet and we were suddenly bathed in stillness and quiet, my own heavy breathing inside my helmet and the ticking of the cooling engine accompanying my thoughts. With the smile clear in his eyes, Ben looked over as he released his harness. “Thanks for coming for the ride”, he said, “hope you enjoyed it”. Understatement of the year I thought….